Warm, soft corn tortillas smothered with fresh tomatillo sauce, black beans, and topped with a fried egg. Huevos Rancheros is a great breakfast… at any time of the day! Do you love Mexican cuisine for breakfast? Going out to be breakfast with all my guys, has to be my favorite. And, if Huevos Rancheros is on the menu, I’m all over it! I don’t even know if I can pronounce it correctly… I’m a blonde with a Utah accent. So, I’m glad I’m just typing this all to you! Instead of going out to breakfast and ordering some Huevos Rancheros, you can easily make this recipe right up in your own little kitchen! The tangy, spicy (or mild) sauce which lays under the fried egg and cheese is really what gives this dish pizzazz! I love using simple tomatillo sauce for my Chili Verde Enchiladas recipe, too. It’s great to whip up this sauce ahead of time and have in the refrigerator for a convenient and fast breakfast like this one. 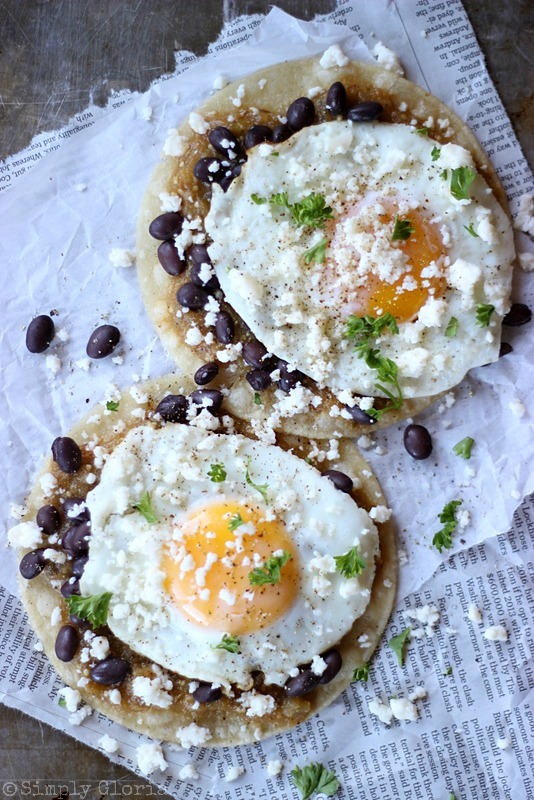 These Huevos Rancheros with fried eggs, black beans, crumbled queso fresco cheese… and homemade tomatillo sauce is all really simple to make and bring all together. 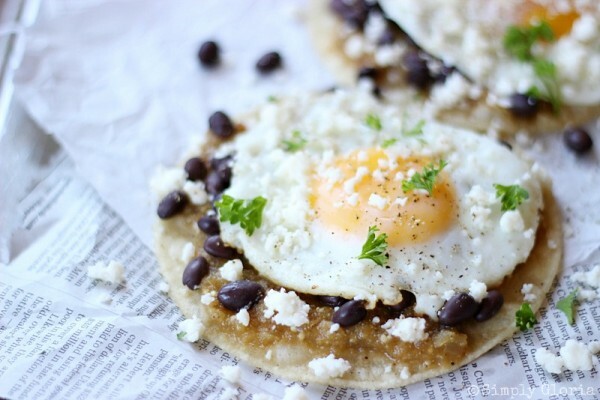 Warm, soft corn tortillas smothered with tomatillo sauce, black beans, and topped with a fried egg. 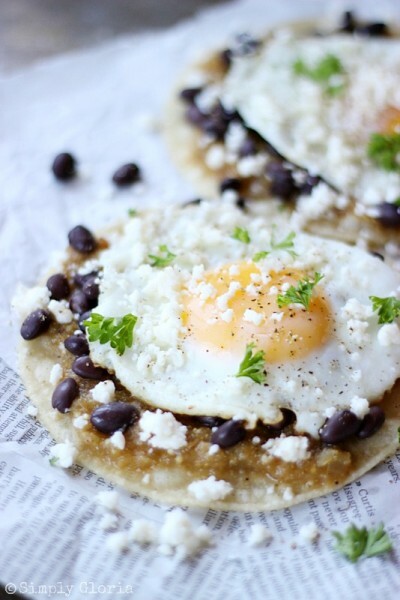 Huevos Rancheros is a great breakfast… at any time of the day! To prepare the tomatillos, peel away the husk and rinse off the stickiness under running water. Place all of the peeled tomatillos in a large pot of cold water. Bring to a boil for 5 minutes. Drain off water and place in a large blender or food processor. Add chopped onions, jalapenos, chiles, cilantro, garlic, lime juice, cumin, garlic and onion powder to the tomatillos and puree until completely blended. Set aside. Heat oil in a small frying pan on medium heat. Place one corn tortilla at a time into the hot oil for 1 and a half minutes on each side. Place on dry paper towels on a flat surface to drain excess oil. Melt 2 tablespoons of butter (or use any other non stick method you would like to use) in a large frying pan on medium heat. Crack 4 eggs into the pan. Put a lid on the pan as so the heat will cook the tops of the eggs without having to flip them. Drain and rinse beans with hot water. Place each corn tortilla on plates and layer them with the tomatillo sauce, beans, eggs, and crumbled cheese. Enjoy! Tomatillo sauce may be stored in the refrigerator for up to a week. Marti, if you’re an egg lover (like I am), then you’d love this! Wow, these look delicious! I love using tomatillos. They have such a delicious flavor and this would be a perfect breakfast recipe to use up some salsa. Thank you so much, Cindy! I have to agree, tomatillos are so gooood! Gloria! I’m coming to your house for breakfast. This is one of my favorite breakfast dishes. There’s a little place in Palm Beach that we sometimes go to to grab breakfast. I usually get the Huevos Rancheros cause it’s so good..and it’s my fav! 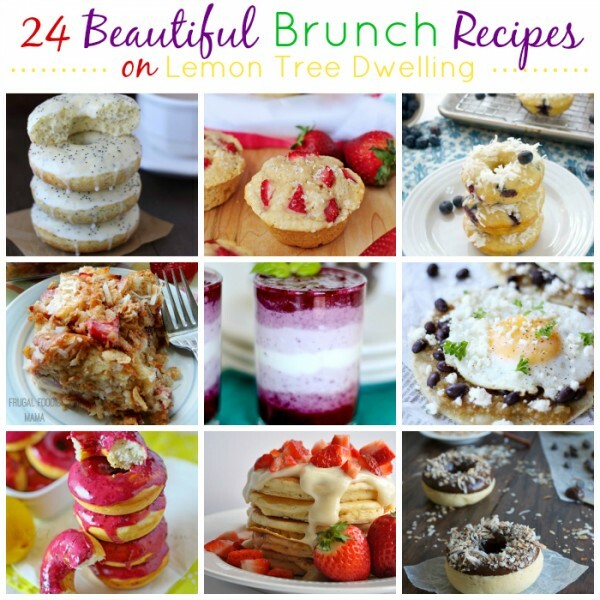 Love your recipe and your pics! Pinned. Yes, you do! You’d love this little restaurant we go to! Great food and great atmosphere. And they have the cutest little cappuccinos that come with a sugar cube stick for sweetening! Oh wow, those look really delicious…MMM! 🙂 I have never made these but the recipe seems easy enough. 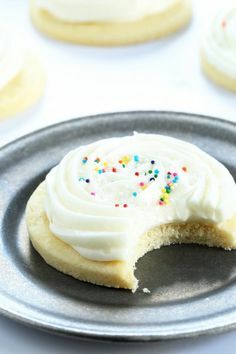 My wife and I love these so I am printing your recipe so that we can try them. I grilled a skirt steak this weekend, grilled tomatoes to make a tomato salsa, grilled serrano chiles… etc. I think you get the pictures and we then used flour tortillas for tacos!! Yum!! Michael, now you’re making me hungry! Omg yes! This is totally my kind of breakfast! I want it tomorrow… badly!!! I don’t normally think of Mexican cuisine for breakfast, I’m usually a boring old oatmeal eater. I’d totally eat this, however, it looks sensational! Gloria, this looks so savory!!! And yes, I love mexican food for breakfast!! Mexican inspired dishes are my favorite any time of the day!! Renee, mine too! Thank you! I can honestly say I don’t think I’ve ever had Mexican for breakfast. And as a Mexican food lover this is such an exciting recipe! Definitely going to try this one out. 🙂 Hope you are having a great week Gloria! Then you’d better give it a try, Chelsea… you’ll absolutely LOVE it! My husband and I have always wanted to try these for lunch at our favorite Mexican restaurant, but we are always scared they will be too spicy! This recipe sounds so good and something we can do at home and make as hot or mild as we want. Thanks for sharing! Yum Yum! My hubby loves Huevos Rancheros and your tomatillo sauce looks and sounds amazing! I wish I had time to make this today! Raquel, thank you so much! Gorgeous! What a great way to start the day! Pinned! This is such a nice way to start a day…especially weekend…I love the idea of the eggs on soft tortilla and yes, the tomatillo sauce just sounds perfect! Juliana, thank you so much! I love Mexican, but have never had it for breakfast. I think I need to change that, based on your delectable recipe! Thanks for sharing at Fridays Unfolded! LOVE huevos rancheros!!! Like, there is nothing I’d rather have when I’m ordering breakfast out. Okay, to be honest, it’s a toss up between this and chocolate chip pancakes when I feeling extra fatty, hahaha. I’m loving this tomatillo sauce as well… pinned. making. devouring! Mmm … huevos rancheros is one of my all-time favorite breakfasts, and I don’t eat it nearly enough;) I can’t wait to try this! I am a huge fan of Mexican flavors- and breakfast is no exception! Any time I see anything Mexican on a menu, I’m ordering it! 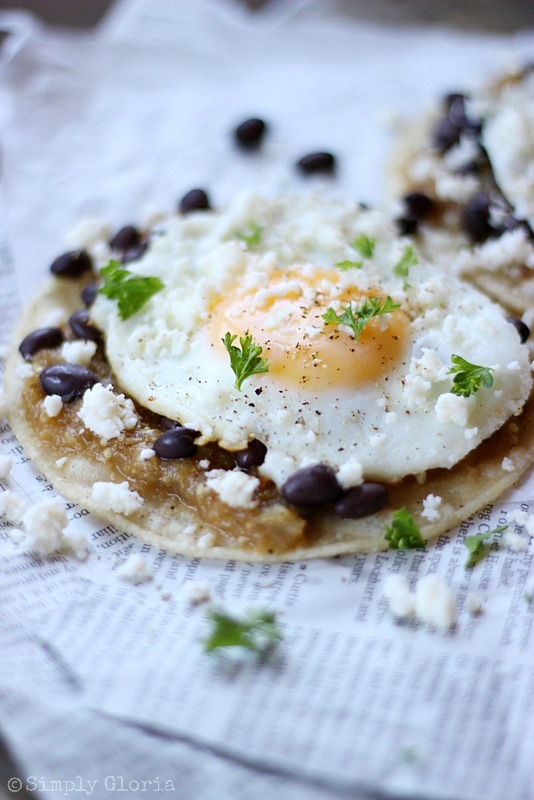 Love your Huevos Rancheros, Gloria, pinning and can’t wait to give this a try! My husband can’t eat eggs but I am all over this for breakfast or lunch or dinner! I’m so excited to see your project on Show-Licious Craft & Recipe Party! Thanks for linking up with us! Ashley, my little one takes off the egg and eats without… and it’s his fave. If your husband is a saucy kind of guy, then he’ll fall in love with the sauce alone! Have a great Saturday! Gloria, these looks so delicious! I’m laughing over you “saying” it versus “typing” it. 🙂 Thank you so much for sharing at Best of the Weekend and pinned, of course! Hope you’re having a fabulous week! I am so excited to tell you that your project us being featured this week on Show-Licious Craft & Recipe Party! We would love for your to share your creativity again with us! The party starts each Saturday morning at 8:00 am EST. You are so sweet, Ashley! Thank you! This looks AMAZING, Gloria! I love huevos rancheros but have never made it myself. Yours looks absolutely perfect! Andi @ The Weary Chef recently posted…Saturday Night Fever #29 with Cute Easter Recipe Features! Andi, you’ll love these! I hate to admit, but now it’s hard to get this when we go out to eat… because I like mine better. Is that so bad to say? !